Just in time for Blackfish season! Post a Blackfish fishing tip, rig or recipe in our special "Blackfish Giveaway" section of our forum and be automatically entered in our raffle! 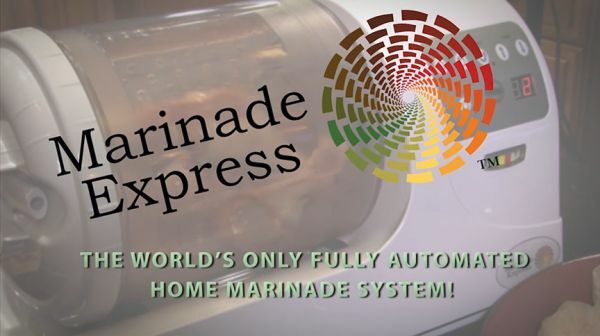 The Grand prize is a brand new "Marinade Express" table top home marinade appliance, worth $300!. This table top home marinade appliance allows you vacuum marinate your food for “Faster Flavor and Better Taste”. Works great on fish, meats, and poultry. I was a little skeptical at first, but was pleasantly surprised on how well it worked on venison and chicken that I tried it with. From what I hear, restaurants have used this technology for years, now it's available for your home. This technology has also been proven to remove a significant amount of bacteria and toxins. Entering the the contest is easy, just post your favorite Blackfishing tip, rig or recipe in the "Blackfish Giveaway 2015" section of our forum. Then on November 30th, all those members who posted will be entered into a drawing for the prize. Will we tape the drawing as it happens and we will post the video announcing the winner on December 12 on the website. Last Edit: 03 Oct 2015 14:20 by Ralph_D. I like the idea of this contest. The best technique that has worked well for me. Starting with line, I like 40# or heavier fluro line to help fight the beast out of the rocks and lesser visibility under water. Next is 30# or heavier braided line compared to the stretch factor of mono and help hold bottom better. I use a torium 14 reel with this setup when in the ocean or targeting big fish. And the best tip of all I can give to get a big fish, is to buy or catch fresh crab such as greens and cut it in half or quarter it, making sure to cut the claws & legs off to make it look like an easy meal and also to let a lot of scent out. 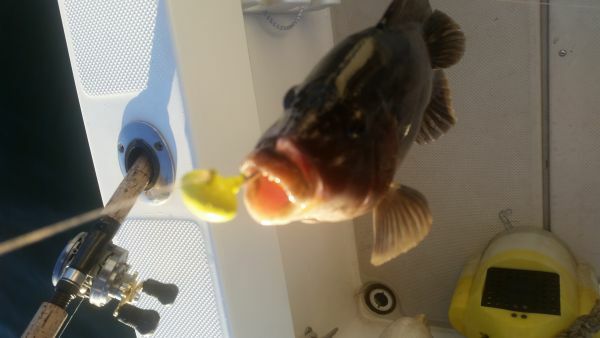 Once you find a nice sticky area with boulders or structure, a nice blackfish should jump all over it, you can even put a whole crab on with a snafu rig, just make sure to wait for the right hit instead of swinging on every bergal that nips at it, and don't be scared to move around to the right piece until you find a nice body of fish. Last Edit: 01 Oct 2015 23:57 by antzfish90. Thanks...you get it...and we appreciate that. Thanks for the tip! Here is a good recipe I found if you like cajun/blackened/spicy fish. Mix all spices together and store in a tight jar. Heat 1 tablespoon vegetable oil in cast iron skillet on medium high heat until very hot, but not quite smoking. Rinse fish fillets and pat dry with paper towel. Rub a little oil on both sides of the fish and sprinkle spice mix on both sides (generously, if you like it hot). Sear the fish in the hot oil for about 1 minute. Flip it and cook the other side. If the fillets are thick, you may need to lower the heat and cover to fully cook the fish. Serve with lemon wedges. leader tied to a jig, again, your choice. I prefer a football style in 3/4 or 1 oz. Bait the jig with half a crab, green or white. No legs, claws or shell. Drop down and wait. Here's the reel tip, yellow jigs are out fishing everything else 10 to 1. Last Edit: 24 Oct 2015 07:14 by Backwater. Okay...so tonight ends the Blackfish Giveaway! I was hoping to get some more entries....but that just means the odds are REALLY GOOD for you guys who posted. We get plenty of views, but unfortunately a lot of people seem hesitant to post. I just want to thank you again for your tips, they are much appreciated. We will write each one of your names on 6 separate pieces of paper each. We will put those pieces of paper in a jar, shake well...and pick a winner. Once a winner has been chosen, we will email that person for their contact information so we can mail them their brand new unit! Hopefully, once you try the unit, you will be able to let the rest of us know how you like it. I have tried it, and I was pretty pleased with the results. I used the Merlot seasoning on some venison and it was pretty awesome. Will plan to post the video of the drawing on December 12th...so please, check back then for the results! Thanks again for those who participated. For those who didn't win...still feel free to reach out to us if we can EVER be of any help to your fishing success. We are here to share! Last Edit: 30 Nov 2015 17:30 by Ralph_D.